For the first time last Christmas, I did not borrow or hire a car throughout my 2-month stay in Nigeria. Since I had used Uber’s taxi booking service in a few other cities I had ben in, I decided to give them a try in Lagos. Whether I was on the island or on the mainland, I found an Uber every single time I requested one – and the highest bill I paid was around N4,000 (I was stuck in traffic). I was so impressed I was compelled to chat with the drivers, just to understand how they got the cars to run their business. 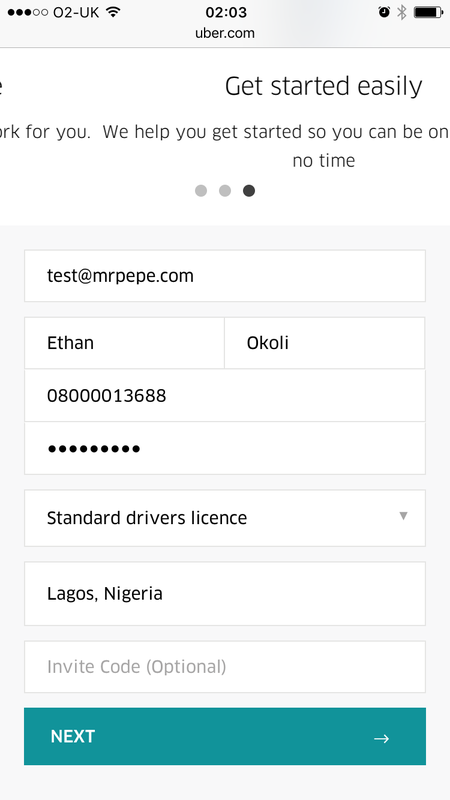 A couple of drivers drove their own vehicles for themselves, but one driver I spoke to revealed that his ‘oga’ was running an organised car hire purchase business on the back of the Uber platform. Since I’m quite familiar with the Uber business model and registration process, I wanted to hear more. 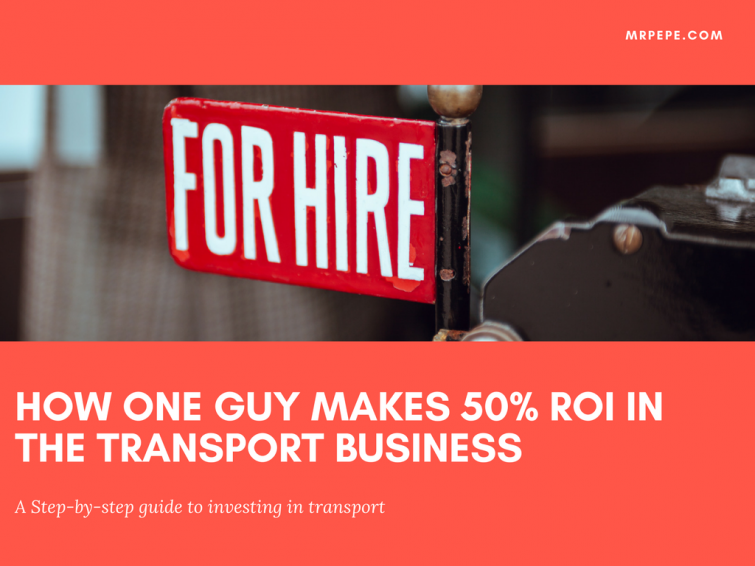 It turned out that the guy made money by purchasing Uber-compliant cars, putting them on the network and reselling them to drivers on hire purchase agreements. With forex at an all-time high, this is music to my ears – much better than fixed deposits. As banks are offering silly rates on fixed deposits (around 2% if you’re lucky), it makes more sense for this guy to “fix” the money in a car instead. So here’s the gist of how it works. 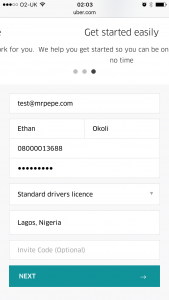 You purchase an Uber-compliant vehicle for N1.1m – N1.3m. You then offer the car to a ready-to-drive Uber-registered driver for around N2m, payable in installments. With payments at N45,000 a week, you will break even after about 7 months. For the rest of the contract, you would be collecting profit. This is over 50% interest in a 12-month period that no bank will offer you. There is no legitimate offer at the moment (I know of) that matches this. Even the so-called MMM offered 30%, but I digress. Uber accepts 4-door saloon cars aged from 2008 or newer. There are rumours that they will accept cars from 2005/2006 in good condition, but take the car to be inspected before you put money down for it, so that you don’t get caught out. To increase your profit margin, buy the cheapest and the most compliant car you can find. Petrol consumption is also a big issue, so you want a saloon with a small engine, otherwise your driver will spend all the money on petrol and won’t be able to make payments. You will seize the car from him and the next driver will do the same. You will think that your village people are sending you bad drivers, but it’s not them – it’s the car. Choose wisely. Personally, I like to look at vehicles online first, because that way, I can save a lot of time by quickly making comparisons and deciding on a suitable car profile. Online I can compare 5 cars in 10 minutes and quickly make a decision, but if I went to the ccar shop, I would probably spend 1 hour comparing 5 cars – not including my driving time to get there and back. Personally, I like to look at vehicles online first because that way, I can save a lot of time by quickly making comparisons and deciding on a suitable car profile. Online I can compare 5 cars in 10 minutes and quickly make a decision, but if I went to the car shop, I would probably spend 1 hour comparing 5 cars – not including my driving time to get there and back. So far, here are a list of cars I find to be good on fuel consumption, and Uber-compliant are Nissan Almera, Hyundai Accent and Kia. Pros: Fast turnaround. Once you decide on a car you want, you can pay, drive off and start on Uber immediately. Cons: Might be a bit expensive as importers also need to make a profit. Cons: You will need to find a shipper, clear, register and maybe even convert the car yourself. You will need to take your vehicle for an independent inspection before it can be put on the Uber network. This is basically Uber’s own MOT program, using it’s own agents to ensure that standards are maintained across the board. This costs N2,000 so you shouldn’t be expected to pay any more or any less for this. To get your vehicle inspected, you will need to book an inspection online. Use one of the links below to book a 20-minute appointment that suits you. Total Service Station: Herbert Macaulay way, Wuse, Zone 5 Opposite. 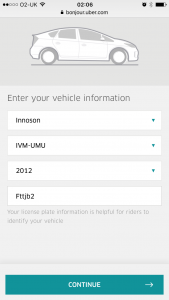 Once you’re done with the vehicle inspection, you will be issued with a vehicle inspection certificate which you will need for the next stage : registering with Uber. If you do fail the vehicle inspection for any reason, you will be given a list of things to fix before you retake the inspection. If this happens, don’t be too disappointed, because Uber will offer your next inspection (at the same center) for free. 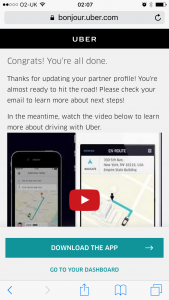 Once your car is ready to go, you will need to register it on the uber network as an Uber partner. 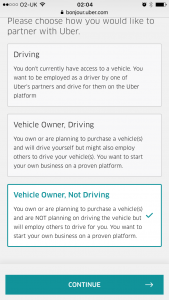 I have extensively covered the Uber partner registration process in a separate post here, but I will spell out the basics for now. Now, you need to find a credible driver who you can trust to make the full payment on your vehicle. From now on, all the costs incurred by your vehicle – petrol, insurance, fees can be classed as running costs. Most successful partners first scout for a driver by offering the vehicle as a rental vehicle for the first month. This will give you both time to get to know each other, and if you are a new partner, this will give you a feel of the estimated costs for running your vehicle – average petrol costs, maintenance costs if any, estimated take home pay etc. You need to remember that drivers who are ready-to-go on the platform must have gone through a series of checks to obtain their state driving licenses, as well as Uber’s in-house background check, so the likelihood of someone running away with your vehicle is slim. From now on, all the costs incurred by your vehicle – petrol, insurance, fees can be classed as running costs. Most successful partners first scout for a driver by offering the vehicle as a rental vehicle for the first month. This will give you both time to get to know each other, and if you are a new partner, this will give you a feel of the estimated costs for running your vehicle – average petrol costs, maintenance costs if any, estimated take home pay etc. I wouldn’t advise signing a hire purchase contract straight away. Get to know the driver first. In this time, you can offer him a rental arrangement of something like N30,000 weekly. Whatever he or she earns above that is his/hers to keep. After the trial period, if you are still happy with the driver, offer the hire purchase option. Depending on the vehicle you have, N40,000 weekly returns can pay off a N2m vehicle in 1 year. It now becomes the drivers responsibility to take care of all the running costs of the vehicle, as the vehicle will become his at the end of the term. One important thing to do is documentation. Do not underestimate the importance of documenting everything. If anything goes wrong, documentation might be the only thing you have to fall back on. You need a legal agreement at the point where the keys change hands, and you need a system to record all your payments made by the driver. Uberkit provides a handy pack that contains everything you need, especially if you are thinking of expanding the business and managing your cars yourself. Business Model Assessment Report: This might come in very useful in writing a business plan if you ever decide to approach banks or investors for a loan. This document helps you understand Uber’s transport business model, and realistic long-term earnings and profit. Quick Summary Guide: This is a quick start guide that shows you how you can get going immediately without working your way through the massive amounts of information. Financial Workbook: This is a workbook customized for uber drivers and partners, helping you calculate/keep track of your profits very quickly whether you’re renting, leasing or buying your vehicle. 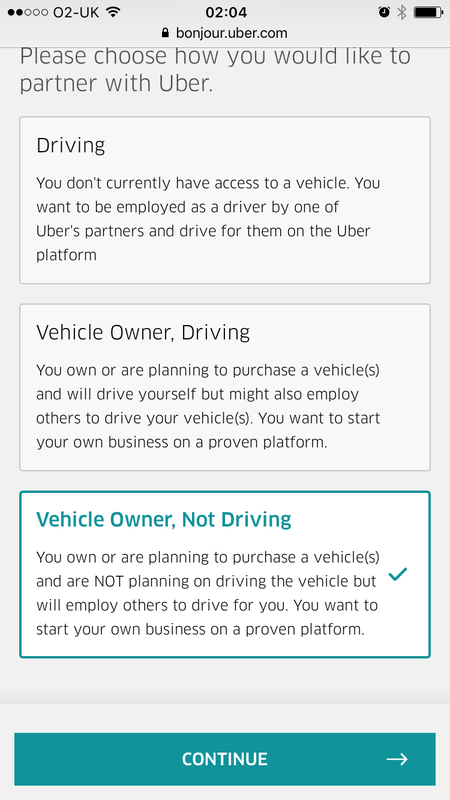 New driver/owner startup checklist: This spells out everything you need to make a success of your Uber business including a process to plan and track fleet expansion. Exclusive list of companies that provide insurance. Sample Drivers Agreement: This is a customizable document which will come in useful when you first begin to sign drivers into your fleet. Sample Drivers Log for profit tracking. This document helps you track and monitor all trips, in order to better understand your expenses and mileage tracking. This could help you identify patterns which you could take advantage of too make more money in the long run. These documents will save you a TON of headache, time and trial, error and general groping around in the dark – especially if you are managing more than one vehicle. I know people who have given up halfway and gone on to hire managers – effectively paying them 2x or even 3x the cost of this kit….monthly. For $47, you get a tested, trusted system which not just saves you money, but also the expense of potentially hiring someone who would need to be hand-held in this field. As always any questions, please feel free to ask me. I’d like to hear your comments. Thanks for this writeup, it is really encouraging. Thanks for the feedback. I have listed some great sources where you can purchase vehicles from, including purchasing from abroad. Sites like Cheki.ng help you purchase locally, and auctionimport.com help you purchase internationally at lowered prices. I think you should budget roughly around N1.8m to get started with a foreign used compliant car. You would be better off driving your own car under a hire purchase agreement as a rental agreement won’t be that profitable for you. Hi Mr Pepe,u don’t know the number of lives this responses of your have greatly inspired.May God continue to be with you.Please I will like to know in a summary how much can possibly be made after uber commission with this present reduction in fares.I intend to go into uber biz and do the driving myself.Thank you. This is so encouraging. Driving your car yourself is the best option on Uber, as you can keep a tight rein on your margins. 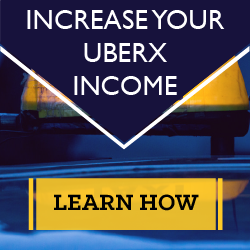 With the reduction in fares, Uber offered a driver payment guarantee, which meant that as long as drivers accept 80% of jobs, they got their payments guaranteed at a minimum of N1400 per hour. This means that if you accept a job that takes you 1 hour to do,and the customer pays you just N600, uber pays the remaining N800 from its pocket. This shows up under your “Promotions” tab. Hello. I am interested in Uber, but my car is 2001 model i do not know if i my car is qualified. Thank you. Hello Ethan and thank you for this write up. Pleasei will need some clarifications from you. I appreciate your encouragement, Ezekiel. Thank you!